heat problems being reported. The Chaintech 6LTM, being the second LX board to enter my testing lab did provide me with a few unexpected surprises. The one that stood out the most was the physical LX chipset on the 6LTM. As soon as the LX chipset was released, rumors began surfacing about the heat produced by the large 386 sized LX chip, in some cases the rumors held true. 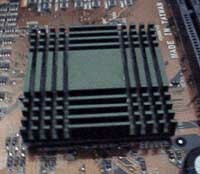 In order to avoid any possible problems Chaintech equipped the 6LTM with a nice green heatsink much like that found on the SiS 5571 chipset, except larger of course. Like the previous two Chaintech boards I tested, the 6LTM features a patented Jumperless CPU Configuration Utility known as SeePU. This configuration utility has 4 built in settings for the Pentium II - 233, Pentium II - 266, Pentium II - 300, and Pentium II - 330, however if none of those factory defaults please you, you have the option of choosing the User's Define setting in which you choose your clock multiplier and bus speed from a provided list, much like ABIT's SoftMenu technology. The familiar AWARD PnP BIOS Setup of the 6LTM also adds to its value, it had no problem with my aggressive memory timings and I never had the feeling that too much power was being stripped from me by a lackluster setup utility. Expansion with the 6LTM is a little better than some other LX boards that have been popping up, but still not as good as I would like it to be. The 6LTM still features the meager 3 DIMM Slots, however the 3 ISA slots and 4 PCI slots (+1 AGP slot) make the future of the 6LTM a little brighter, especially if you plan to use more than just 2 ISA cards like most people. The 6LTM's strengths don't come from its expansion capabilities, however they come from its performance and stability. The stability of the 6LTM is about on par with the Megatrends FX83-A, and in some cases, better! I can run my Pentium II 266 up to 338MHz (75 x 4.5) without any problems, although getting the entire system to function at that speed is a bit tricky. At all normal and overclocked CPU speeds the 6LTM outperformed both the FX83-A and the FIC KL-6011 by a minimum of 1 winstone point! After re-running the tests with a genuine Intel Pentium II - 300, the 6LTM proved to be one of the most stable LX motherboards ever reviewed on Anand's Hardware Tech Page. The 6LTM is stable enough, if cooled properly, at 375MHz to produce some extraordinary Winstone scores (see below). The video performance of the 6LTM still can't keep up with the amazing standards instilled in me by the FX83-A, but they come pretty close, which is overshadowed by the excellent real-world performance of the 6LTM. Here's the tricky part...is the Chaintech 6LTM too good to be true? Here are my Recommended BIOS Settings for those of you who have been having problems with the 6LTM and higher bus speeds. I personally have had no problems with the 6LTM and higher bus speeds related to memory timings, therefore I have provided two columns of settings. One for use with 66, 75, and 83MHz bus speeds and the other for the failsafe settings.